It’s easy to get carried away when planning your wedding. It’s your day, and everything has to be perfect, right? Fortunately, you don’t have to spend an exorbitant amount to have a spectacular wedding; in fact, many of the most unique, beautiful weddings are created on a budget. Here are several cost saving methods you can use to plan a spectacular wedding without breaking the bank. Renting a private wedding space is one of the larger extravagances in which couples tend to indulge; however, you can save quite a bit of money just by simply going outdoors. Outdoor weddings are more cost effective, and often a friend or family member will rent out their space for next to nothing, or, in some cases, for free. Decorations create the atmosphere for your wedding, and often couples go overboard with decorations in an attempt to create a particular ambiance. Generally, though, less is more, and limited, thoughtful decoration choices can be much more successful in the end. Look for decorations that have multiple uses. Wedding Sparklers Outlet sells multiple sizes of wedding sparklers for your wedding. The wedding sparklers add fun to your reception and can also be used for timelapse photography. 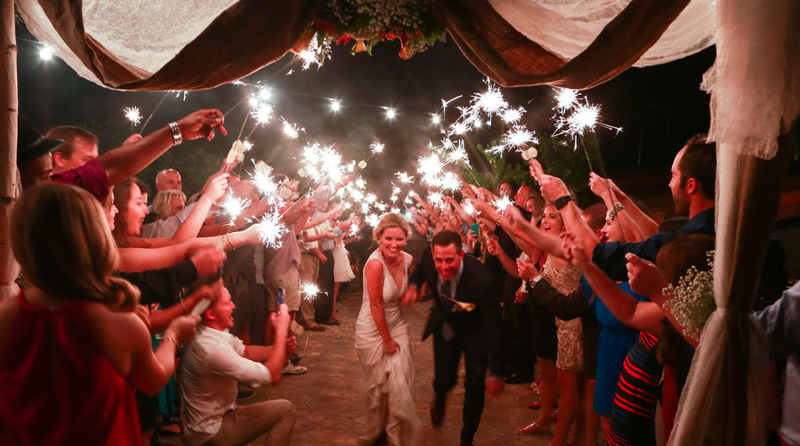 Browse the best sparklers for your wedding today at Wedding Sparklers Outlet. Desserts, multiple entrees and appetizers can rack up a huge bill on your wedding day. In order to save money, look at other food options to mitigate the expense. Food trucks, for example, have become incredibly popular for weddings on a budget. They are mobile, you can offer just one or two options, and they add a bit of fun to the dinner party. Throwing a wedding can be challenging and stressful, but by using a few of these tips, you can have a wedding everyone will remember at half of the cost.